HNZ Potash, a joint venture of Hunt Oil and NZ Legacy Resources, an Arizona land and ranching company, have permitted ten more coreholes into the Holbrook basin potash deposit (AZOGCC permits 1000 - 1009). They previously permitted 10 wells that have yet to be drilled. It looks like they are waiting to carry out the combined larger drilling program at one time. The HNZ permits are located to the southeast of Petrified Forest National Park lands, shown in purple at right. The company reports a land position of 74,000 acres. 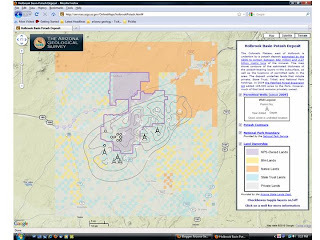 The core holes are permitted by the AZ Oil & Gas Conservation Commission, which is staffed by AZGS. AZGS estimates 682 million to 2.27 billion tonnes of potash in the deposit. Meanwhile, global demand for potash is surging, which bodes well for the Holbrook deposit, which could constitute as much as 25% of all the potash in the U.S., according to our published report. Mineweb.com reports that PotashCorp of Saskatchewan announced that they are effectively sold out of potash for the first quarter of 2011. The company predicts the spot price will ramp up, with contract prices hitting $450 per tonne by year end, along with record company production. Global shipments,which hit 52 million tonnes in 2010, are expected to reach 55-60 million tonnes in 2011. Making Arizona the "Grand Canyon State"